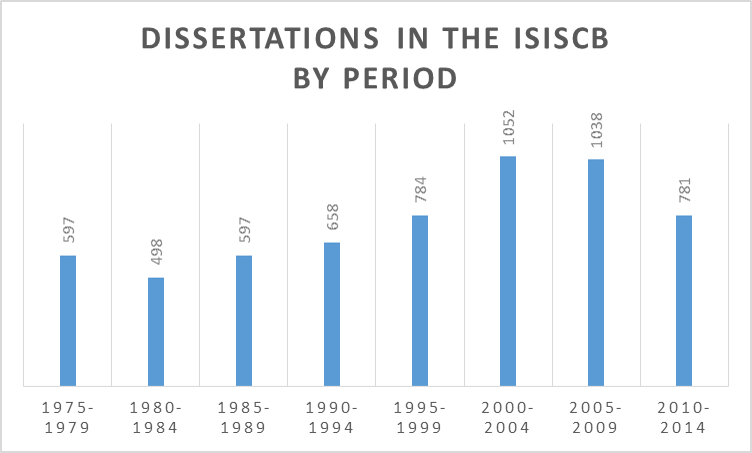 There are slightly over 6,000 dissertations in the IsisCB which can be used to explore the institutional development of history of science. 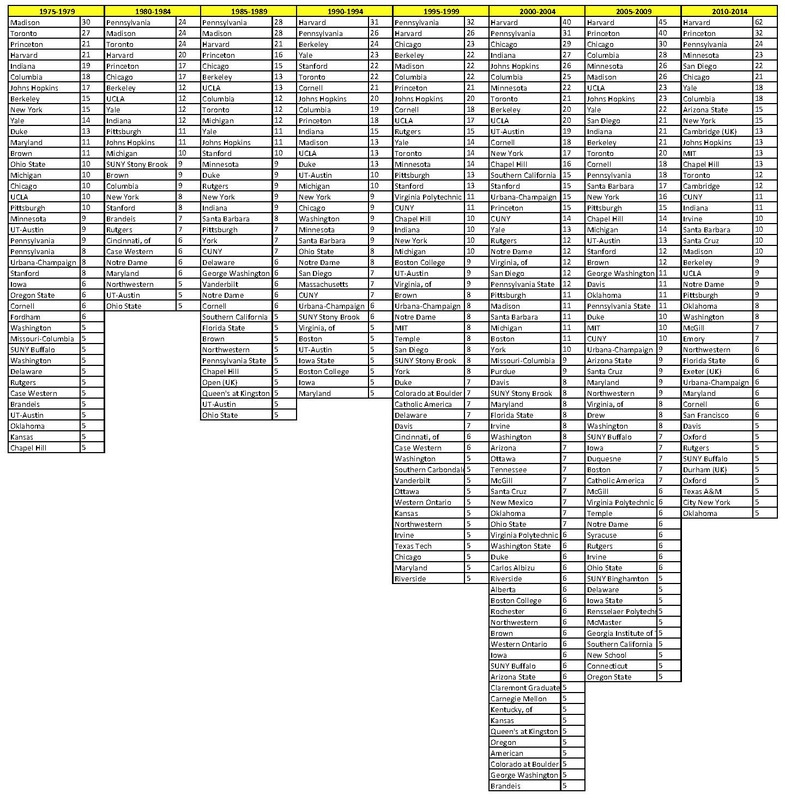 Anyone familiar with the history of our discipline won’t be too surprised by the list of schools at the top, but the size and number of theses is impressive for a modestly-sized discipline like ours. 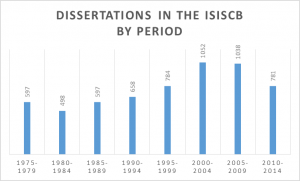 One can go directly to the list of Theses in IsisCB Explore if you are interested, and you’ll be shown the whole list, including a number of dissertations that I’ve excluded from my analysis. The graph raises interesting questions. I have not yet separated schools with specific history of science programs from other schools, but doing so would help us understand more about the reasons for specific strengths. The patterns here seem to be relatively accurate for North America, indicating the ebb and flow of institutional strength over time as scholars come and go and institutional priorities change. This is a fascinating picture of how scholarship has emerged in the past forty years. 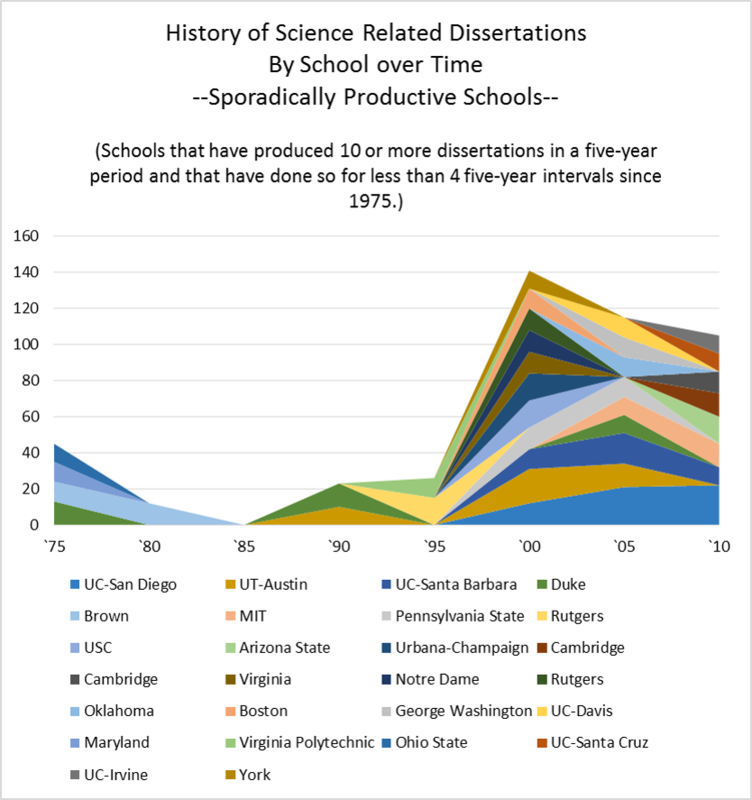 You can see the major history of science institutions in the discipline at the bottom and how they are gradually supplemented by a more diverse cohort as new players enter the field, especially in the early 21st century. 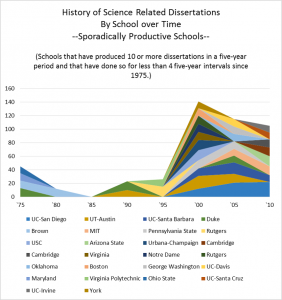 To make that pattern more evident, the following graph to the right shows only those schools that have only broken through the 10-dissertation cutoff three or fewer times in the past 40 years. Notice how the number of new powerhouse schools shoots up in the 2000s and continues into the second decade of the century. I’m not sure what to make of the decline in the last five-year interval. I’ve compared it with the DAI data, and it tracks well with that. According to the most recent NSF survey, humanities PhDs have not declined in real numbers during that time (https://www.nsf.gov/statistics/srvydoctorates), so the change seems to reflect something about the way that the field is developing relative to other humanities disciplines. I’ll certainly be looking into this as I move forward. One should be careful not to read too much into those numbers. The CB data are inevitably skewed. There is no way that a single bibliographer can be entirely comprehensive or objective in his or her selection. The selection is affected by both the individual curator’s professional judgments about what constitutes a relevant work for inclusion and by the limitations of the resources available to find dissertations. The most serious gap that I find in this list is that it is almost entirely from the US. There are two schools in Canada that make the top 50 (Toronto and York) but you don’t even find Oxford and Cambridge until you get far down the list. European (and to a far lesser extent South American and Asian) institutions simply are missing. This is largely a gap in the resources available to find theses. Both John Neu and I have used Dissertation Abstracts extensively, and it has had a strong American focus over the years. Looking at data visually like this can be very useful because it brings home the biases in the data. This visualization helps both me as curator and you as user to understand where the limits are and when you and I ought to start looking elsewhere to pick up items that are simply missing. Great work, Stephen. The figures you give show how much is still to be done. European data can be partly acessed via The DART-Europe for Electronic Theses and Dissertations (ETDs), though their entry fields will not compeltely match to IsisCB Explore. Unfortunately, most dissertation citations around the world are still in a non-digital form. And I really appreciate the shortcut Theses in IsisCB Explore.